Join the Charleston Area Alliance for our 2018 Celebration - the "Business Event of the Year" - at the newly-renovated Charleston Civic Center on Monday, October 29. This is an opportunity to celebrate economic and community development with hundreds of business colleagues from across the Kanawha Valley. 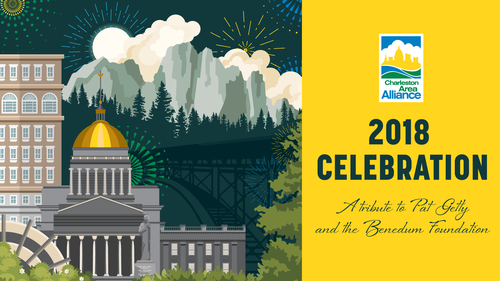 And this year, it is a chance to pay tribute to philanthropic efforts that have made a profound difference in our region and state. There are few, if any, West Virginians who have not been impacted by the work of the Foundation. During Mr. Getty’s tenure as President alone, the Foundation awarded nearly 1,900 grants across our state - totaling more than $200 million. Don’t miss our 2018 Celebration as we hear reflections from Mr. Getty and pay tribute to his leadership - and to the lasting, remarkable impact of the Benedum Foundation’s philanthropy in our community and beyond. Registration is $125 Alliance members/$200 future members before October 18 at 6 p.m. Prices increase to $175 Alliance members/$250 future members after October 18 at 6 p.m. Registration deadline is October 25.